ARTCOUNTRYCANADA.COM CALL US TOLL FREE AT 1-877-265-4555 --- Click ARTIST DIRECTORY for all artists. 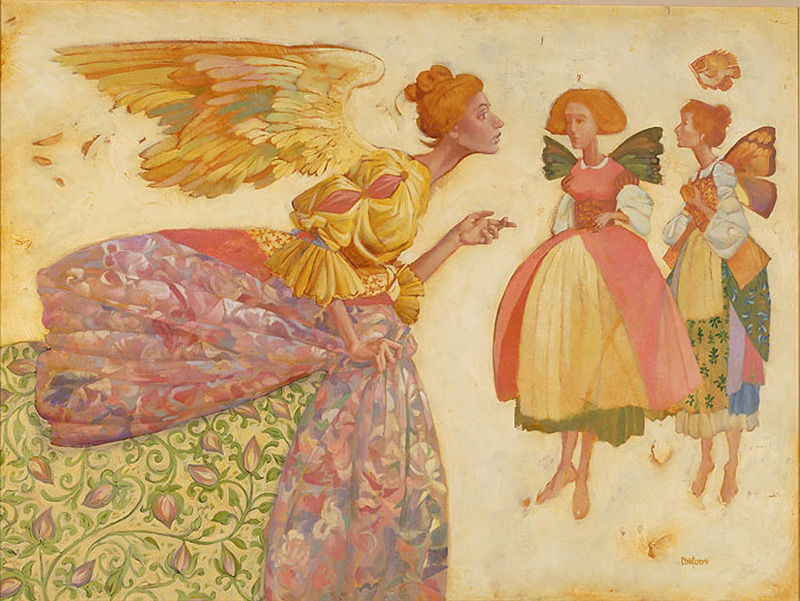 We represent the entire collection of James Christensen.
" ANGEL WITH TWO FAERIES "
are faeries. These social yet mischievous creatures commonly make fleeting and momentary promises. between them could be based." created that included "Angel" (his most recent sold out fine art edition release). "Faith, Hope and Charity"
and "Three Clowns" were also painted around the same time. Fine Art Giclee Canvas will hang resplendently by itself. Hurry and order yours before this piece of magic disappears.